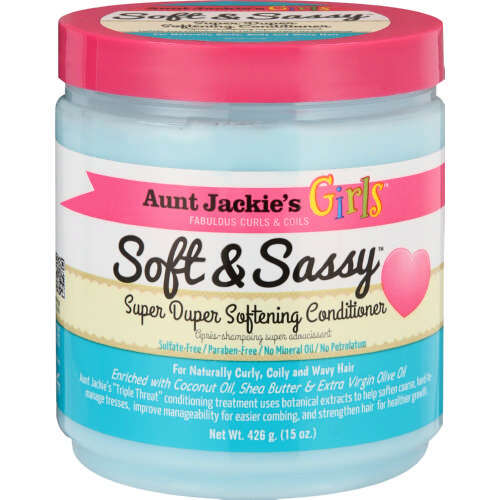 Aunt Jackie’s Girls Super Duper Softening Conditioner 426g is specially formulated with botanical extracts to help soften coarse hair for easier combing and manageability. Also helps to strengthen hair and promote healthier hair growth. Contains no sulfates, parabens or mineral oil. As a normal conditioner - apply generously, from roots to ends, on wet or towel dried hair. Leave on for 1 minute, then rinse thoroughly with lukewarm water. As a co-wash - wet hair then generously apply from roots to ends, gently massaging into hair and scalp, in similar fashion to shampoo. Rinse and repeat. After final rinse, apply as a normal conditioner. As a deep conditioning treatment - apply generously, from roots to ends, on towel dried hair. Cover hair with a plastic cap and sit under a hooded dryer for 10 minutes. Remove cap and thoroughly rinse. For optimal results, towel dry hair and apply Aunt Jackie's Girls knot havin' it leave-in ultimate detangling moisturizer.